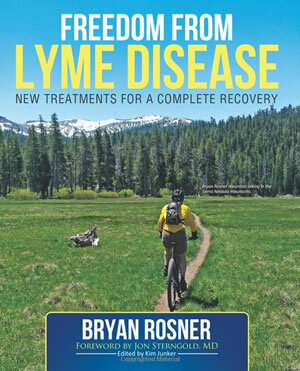 An effective Lyme Disease Diet is found in Freedom From Lyme Disease by Bryan Rosner. This book outlines a treatment plan for Lyme Disease based on research and personal experience. The information in this book is based on his journey overcoming Lyme disease and the experiences of other Lyme sufferers. Additionally Rosner has evaluated scientific studies and collaborated with physicians who specialize in Lyme disease treatment around the world. Freedom from Lyme Disease informs readers about cutting-edge strategies with the potential to shorten the duration of recovery from Lyme disease. This book describes a variety of available treatments and explains how to integrate them to create a customized plan. Rosner says that trying to find the “best” way to treat Lyme disease can be counterproductive. Lyme disease is an extremely complex illness with many complicating factors and each individual is unique. So instead he recommends a flexible way of managing Lyme disease that he refers to as the “treatment template“. This approach provides sufferers with a way to evaluate different modalities to decide whether each one is appropriate for them. When a Paleo diet is used for weight loss the amount of carbohydrates are severely restricted. Rosner’s version of the Paleo diet for Lyme disease allows for a higher level of carbohydrates. Dieters are encouraged to be flexible with their eating plan. The goal isn’t to follow the diet in a rigid fashion but to implement it in a way that works for your individual chemistry. The Lyme Disease diet he recommends centers heavily on fresh vegetables. However, the majority of calories are derived from animal products and healthy fats. Chicken, turkey, eggs, salmon, beef, lamb, bacon, whey protein, heavy cream, butter, coconut oil, peanut butter, pecans, almonds, flax seeds, quinoa, gluten-free bread, avocado, asparagus, mushrooms, lettuce, tomato, celery, blueberries, pineapple, raisins, dates, cacao powder, stevia. The Lyme Disease Diet assets that you can’t expect to get better if you don’t exercise. However, many Lyme disease sufferers have difficulty tolerating exercise. In this case even if you can only manage a small amount of exercise it is better than nothing. Exercise specifically benefits Lyme disease in several ways. Freedom From Lyme Disease: New Treatments for a Complete Recovery retails at $49.95. Presents an alternative to conventional medical treatments for Lyme disease. Offers information on the various methods that may shorten the duration of recovery from Lyme disease. Explains in detail the underlying physiology that may be involved in Lyme disease patients. Includes advice on recommended foods and meal suggestions. Provides tips for overcoming roadblocks to recovery. Many of the Lyme Disease Diet recommended treatments and protocols are expensive. The amount of information might be overwhelming to someone new to alternative healing methods. Individuals may respond uniquely to the proposed therapies and not all techniques will be effective for everyone. Freedom From Lyme Disease offers readers a comprehensive evaluation of the different options available to support recovery from this condition. The information outlined in this Lyme Disease Diet can be of benefit to sufferers of chronic Lyme disease who are not responding favorably to conventional treatment. It offers a holistic approach that may greatly enhance general wellbeing and improve the outcome for Lyme disease patients.